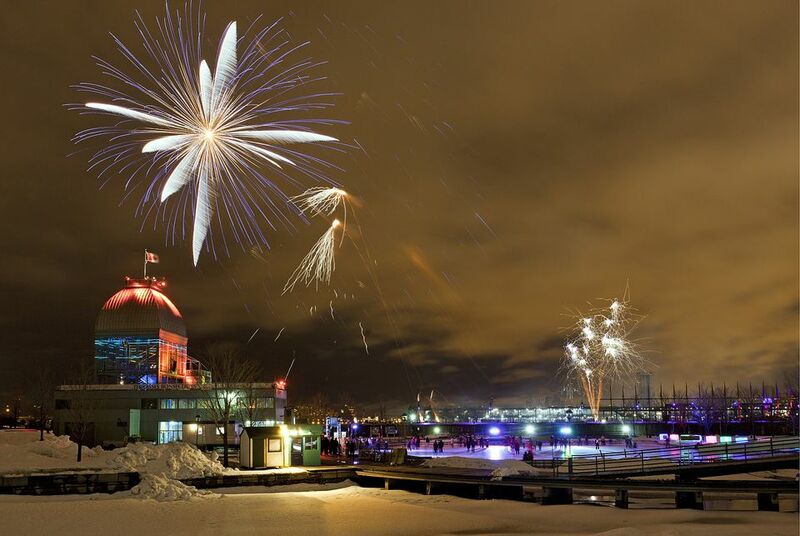 An annual tradition at the Old Port that rang true until its sudden cancellation in 2015 only to return in the nick of time for the 2016-2017 season, every Saturday night sky in Montreal in December lights up with Fire on Ice. Dubbed "pyro-musical'' shows, spectators look forward to fireworks—or feux d'artifice in French—choreographed to sound. The show usually starts at 8 p.m. and lasts about 15 minutes at the Bonsecours Basin. As with every edition, Fire on Ice is free admission and open to all. Fireworks can be seen at the Old Port almost every Saturday in December and, as usual, the 2018 season is expected to extend into January 2019. They can be seen at 8 p.m. on December 15, 22, 29, 2018 and January 5, 2019. There will also be a display on New Year's Eve (December 31) but it is not organized by Fire on Ice. You can read more details here. This is arguably what makes Old Port fireworks so special in the winter. Not only do spectators get to watch Fire on Ice, they can skate to them too. Either bring your own skates or rent some on site at the Bonsecours Basin. The rink is open between December 8, 2018 and March 2, 2019. Thrill seekers will be pleased to know that the first urban zip line in Canada is open for business in the winter. But you'll have to get there early. The Old Port Zipline is accessible winter weekends from 11 a.m. to 5 p.m. Consider dinner in the area to pass the time until the fireworks start at 8 p.m. Nearby favorites include Modavie, La Champagnerie, and Le Bremner. Note that affordable family dining is hard to come by in Old Montreal. Your best budget bet is to walk over to Montreal's Chinatown. It's 10 to 15 minutes away by foot. One of the favorite Montreal holiday season traditions is the grassroots Marche de Noël aux flambeaux, a candlelit walk open to everyone crowned with a charming fireworks show held above Parc La Fontaine. The holiday festivities are almost all free and easily accessible. Most are held throughout the month of December up until New Year's, but check each event's hours individually to be sure. If you're looking to park in the Old Port area of Montreal, most garages cost $12 to $15 CAD. The Old Port area stretches along the promenade along the St. Lawrence River. It encompasses the Montreal Science Centre, Jacques-Cartier Pier, and the historic clock tower. When Should Your Christmas Tree Be Recycled in Montreal?